The British Association for Martial Arts promotes a wide variety of courses and events, many of which are open to everyone. Of course, some are for members only, and most of the time members receive a discount compared to non-members. January 12th - Bully Buster. 1-2pm for Primary School aged children. 2.30-4 for Secondary School aged children. Please call 01626 360999 or log on to the Members Booking Page for details. Non members welcome, no experience necessary, no special clothes or equipment required, just wear something you can train in. January 26th - Little Warriors stripe test. January 27th - Kyu Grading. February 2nd - Bunkai Fundamentals seminar 1-4pm £15 per person. Please call 01626 360999 to book your place. March 17th - Kyu Grading, Newton Abbot, Devon. March 23rd -Bunkai Level 2 - Tuite. Hands-on Seminar 1-4pm £15 per person if booked before 18th March, £20 thereafter. Please call 01626 360999 to book your place. Adults of all grades and styles welcome. May 4th & 5th - UK Martial Arts Show, Doncaster. Tickets are £79 for entry and training through the official website. Please contact us directly to get that reduced to £35. May 12th - Keikokai 20th Anniversary Training Extravaganza. May 19th - Saifa and Seiuchin bunkai seminar in Essex. 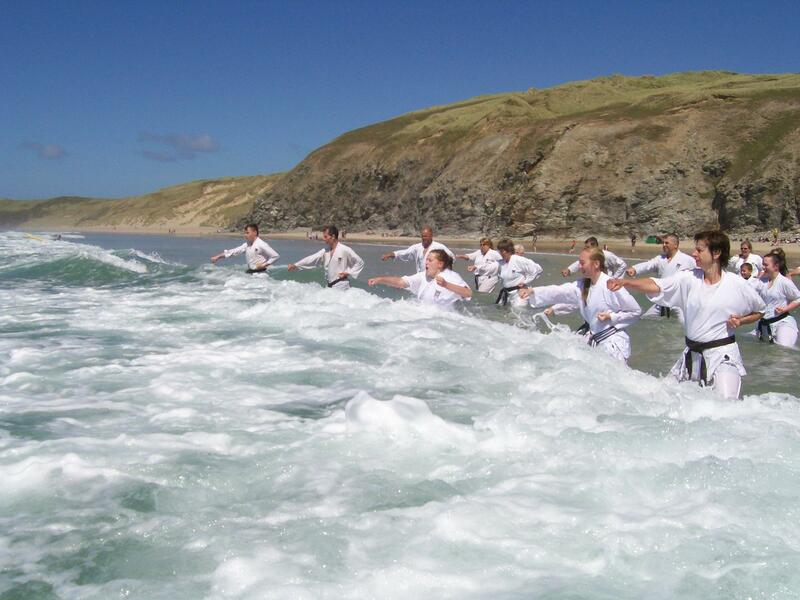 May 31st -June 2nd - The South West Karate Experience at Perran Sands, Cornwall. Training on the beach with Anthony Blades kyoshi, Neil Ellison renshi, and John Burke renshi. To book your place, please call 01626 360999. June 22nd - South West Martial Arts and Wellbeing Expo. Bristol. July 7th - Kaizen Martial Arts Expo. Nottingham. August 31st - September 2nd - Brecon Training Course, outdoor training in the beautiful Brecon countryside with Anthony Blades kyoshi, John Burke renshi, and Martyn Skipper sensei. To book your place please call 01626 360999. September 21st & 22nd - Holland Bunkai seminar weekend with Renshi John Burke 6th dan. September 21st & 22nd -BAMA North East England present a weekend of training with Renshi Stuart Howe 6th dan and Renshi Neil Ellison 6th dan. October 26th & 27th - Finland Bunkai seminar weekend. November 9th & 10th - Scotland Bunkai seminar weekend. Watch what we organise for the rest of the year! In years gone by we have hosted seminars, courses, and workshops with Terry Wingrove, Patrick McCarthy, Terry O'Neill, Vic Cook, Julian Mead, Anthony Blades, Russell Stutely, Stuart Howe, Neil Ellison, John Burke, and others.